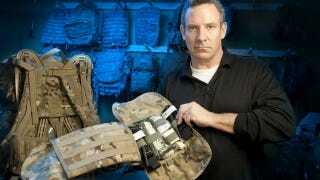 The Army's IFAK—Individual First Aid Kit—used to be built into a SAW ammo pouch. This was a terrible solution as the pouch would continually get caught on other equipment—not what you want in a fire-fight. But no longer! The US military has just overhauled this life-saving accessory. Seated on the hip, the old-style IFAK was "just kind of a brick on your side that gets in the way of everything," said Rich Landry, Product Manager of Soldier Clothing and Individual Equipment, at NSSC. To correct this, Army engineers completely revamped the design of the kit, allowing it to be carried on the small of the back. In addition to the new position's advantage of fitting under the soldier's backpack and being more easily accessible, it packs more supplies as well—including two combat tourniquets compared to the typical single compression bandage. And that's critical for us, because the big picture in load carriage is the backpack piece. That's where a large percentage of the load and bulk comes from. And it's critical that we still have to be able to carry that. All you do is reach back and pull (the IFAK) out, and it doesn't matter what side you pull it out from. So if this hand is injured, you can reach behind with this (hand) and pull it out, or your buddy can get to it.